Serving Northwest Ohio - OH, including: Perrysburg, Toledo, Maumee, Oregon, Sylvania, and Bowling Green. Go-Key Rentals/Leasing is a locally owned & family operated business (Perrysburg-Toledo) that has been servicing Northwest Ohio & Southeast Michigan since 1990. 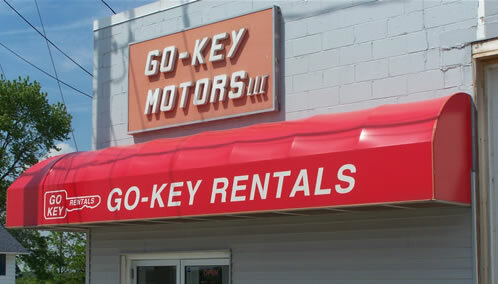 Over the years, Go-Key has worked hard to establish itself as our friendly neighborhood automotive rental location. We can help your transportation needs, whatever the situation. We offer very clean new model vehicles with some of today's latest technology & models on the market. Whatever your need, we will be there to assist you along the way. We thank our customers everyday for trusting us to be their automotive partner whether it be an individual, group, or company. We treat everyone like they are part of the Go-Key family. So remember when the need for a vehicle rental is in your future, call your friends at Go-Key Rentals/Leasing for a great rate & friendly service. Gibsonburg, Findlay, Oak Harbor, Sandusky, Wauseon, Fostoria, Sandusky & all of Northwest Ohio. Whiteford Center, Dundee, Tecumseh, Ida, Petersburg, Blissfield, Luna Pier & all of Southeast Michigan.